They were speaking Spanish and walking through a parking lot. 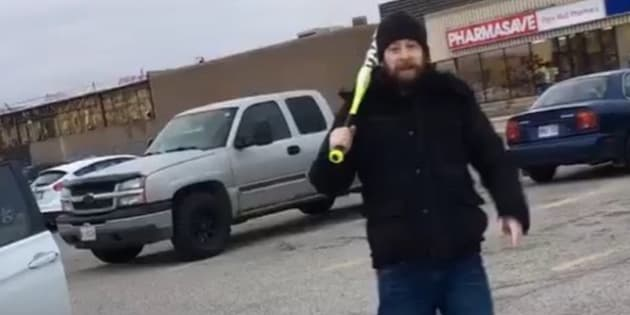 A man wielding a bat attacked a family in southwestern Ontario on Thursday, yelling that they were terrorists and that they were a part of ISIS. A woman, her husband, their 13-year-old son, and another man, all Colombian, were walking through in the parking lot of the Elgin Mall in St. Thomas, Ont. speaking Spanish when a man carrying a bright green baseball bat approached them, according to CityNews. "You're under arrest," the man says. "Because you're a terrorist." #in#stthomas#ontario#we#were#victims#of#hate#I#am#so#sad#he#was#going#to#attacked#my 13th year son with a baseball bat, and calling him a terrorist. As this individual went to hit my son and his father stepped in to prevent this man from beating him. Due to this fact my hubby got the attack on him causing him to have sever bruising to his back, and a broken ribs. When the person recording refuses to give the man his cell phone and one of the adults refuses to empty his pockets, the man begins yelling for help, and shouts, "we got terrorists here," and "ISIS!" The man with the bat swung at the group several times. Emergency crews were called to the parking lot at 4:30 p.m. and one man was taken to hospital with broken ribs, according to CityNews. Police arrested a 36-year-old man in London and charged him with aggravated assault and three counts of assault with a weapon, according to 980 CFPL. St. Thomas police are investigating the attack as a racially motivated incident, according to CBC News.